Directed by Larisa Sheptiko and written by Valentin Yezhov and Natalya Ryazantseva, Wings is the story of a once heroic fighter pilot who copes with living an ordinary yet dreary life as a school headmistress. The film follows a woman trying to deal with the role she is living as well as the life she used to have. Starring Maya Bulgakova, Zhanna Bolotova, Pantelemion Krymov, Vladimir Gorelov, Yury Medvedev, and Nikolay Grabbe. Wings is a rapturous and evocative film from Larisa Sheptiko. The film is a character study about a World War II pilot who was once seen as a hero as she copes with peacetime just 20 years after World War II where she is a school headmistress and a member of the city council. It is an exploration of different generations and the struggle for a woman to connect with not just her students but also her daughter who has gotten married. Much of it is told in a straightforward narrative with some flashbacks as the film’s screenplay follows the character of Nadezhda Petrukhina (Maya Bulgakova) who is trying to run a trade school that is in the middle of construction as she deals with the expulsion of a student at the school but also the new marriage of her daughter Tanya (Zhanna Bolotova) whom she hasn’t seen much as their relationship is quite strained. Especially as Nadezhda becomes miserable as she often thinks of her past where her life meant something. Larisa Sheptiko’s direction is quite intoxicating to watch not just for some of the aerial scenes but also for much of the dramatic moments including the flashbacks. Shot in a city in the Soviet Union, Sheptiko does use some wide shots to establish some of the locations but prefers to aim for medium shots and close-ups to play into the intimacy that is Nadezhda’s story. The film follows Nadezhda in the way she works as she tries to run a school where she would fill in for an anguished student during a stage performance as well as deal with a student’s expulsion as she tries to get him to apologize to the girl he hit. Sheptiko’s direction is very restrained in the way it plays with Nadezhda’s frustrations with her life as the scenes involving Tanya show not just this tension but also a sadness as it play into some unresolved issues as well as Nadezhda’s own sense of loss dating back to the war. The film’s climax isn’t just about her making some decisions in her life but also reflecting on what she lost in the aftermath of war. Overall, Sheptiko creates a ravishing yet somber film about a war pilot dealing with the dreary life in peacetime. 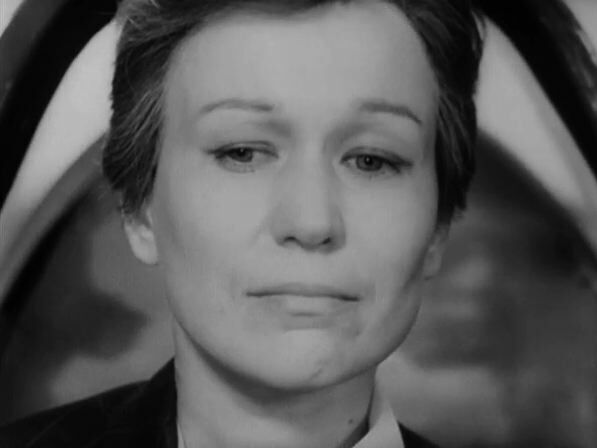 Cinematographer Igor Slabnevich does brilliant work with the film’s black-and-white photography with its usage of soft lighting and textures to create a dream-like feel in some scenes with some unique lighting for the play scene. Editor L. Lysenkova does excellent work with the editing with its usage of jump-cuts as well as some stylish cuts to play into the drama. Art director Ivan Plastinkin does fantastic work with the look of the school as it is being constructed as well as Tanya’s apartment and a museum that Nadezhda visits late in the film. Costume designer A. Dokuchayeva does nice work with the costumes as it is mostly casual in its uniform look as well as the stage clothes worn for the play. The film’s music by Roman Ledenev is amazing for its somber orchestral score that play into the drama as well as the sense of loss and longing that Nadezhda has. The film’s incredible cast feature some notable small roles from Nikolay Grabbe as the troubled student Kostya Shuvalov, Yury Medvedev as a teacher/administrator at the school, Vladimir Gorelov as Tanya’s much-older husband Igor, Leonid Dyachkov as Nadezhda’s lover Mitya from the flashbacks, and Pantelemion Krymov as Nadezhda’s current lover and professor Pavel Gavrilovich whom Nadezhda is in a loveless relationship with. Zhanna Bolotova is wonderful as Nadezhda’s daughter Tanya as a young woman trying to create her own life as she is reluctant to let her mother into her life as also gives some advice about Nadezhda’s unhappiness. Finally, there’s Maya Bulgakova in a phenomenal performance as Nadezhda Petrukhina as a woman who was revered as a World War II fighter pilot who copes with the role she is in during peacetime as she tries to move on and deal with life as a school headmistress as she yearns for her youth and to feel that moment where she mattered as it’s a performance filled with radiance and elegance. Wings is a tremendous film from Larisa Sheptiko. Featuring a mesmerizing performance from Maya Bulgakova as well as gorgeous images and captivating themes of identity and youth. It’s a film that is just ravishing to watch as well as providing a unique character story into a woman unsatisfied with the way her life has turned out and the need to do something about it. In the end, Wings is an outstanding film from Larisa Sheptiko.